The acoustics of eavesdropping: How curved ceilings and walls redirect and amplify sound. Where not to have a private conversation. Excerpted from The Sound Book: The Science of the Sonic Wonders of the World by Trevor Cox, out now from W.W. Norton & Company. For centuries, people have known that curved surfaces amplify sounds and allow covert listening. Athanasius Kircher, who wrote extensively on echoes, gave a good explanation in the 17th century. His publications also document some fantastical devices, including giant ear trumpets built into the walls of royal chambers for eavesdropping. Probably his most famous—or infamous—device is the Katzenklavier (literally, “cat piano”). It has a normal piano keyboard in front of a line of cages, each of which has a cat trapped inside. Every time a piano key is pressed, a nail is driven into the tail of one unfortunate feline, which naturally screeches. With the right set of cats, ones that shriek at different frequencies, a sadistic musician could play a tune on the instrument. The sound would have been excruciating, but then it was designed to shock psychiatric patients into changing their behavior, rather than being a genuine instrument for playing Monteverdi or Purcell. Fortunately, it is unlikely that it was ever built. At this point you might be doubting the sanity and rationality of Kircher. Yet he drew diagrams that illustrated a good scientific understanding of how an elliptical ceiling can enhance communication between two people. Simplified tracing of a plate from Athanasius Kircher’s Phonurgia Nova, 1673. The lines in the diagram show the paths that sound “rays” take when going from the speaker to the listener. These ray paths can be worked out using a ruler and protractor. Alternatively, by treating the room as a weird-shaped pool table, the paths can be worked out by following the line a cue ball would take (ignoring gravity). If the cue ball is placed at the speaker’s mouth and fired toward the ceiling, it will always go to the listener. So all the sound going upward is focused at the listener, allowing even quiet whispers to be heard across a large room. 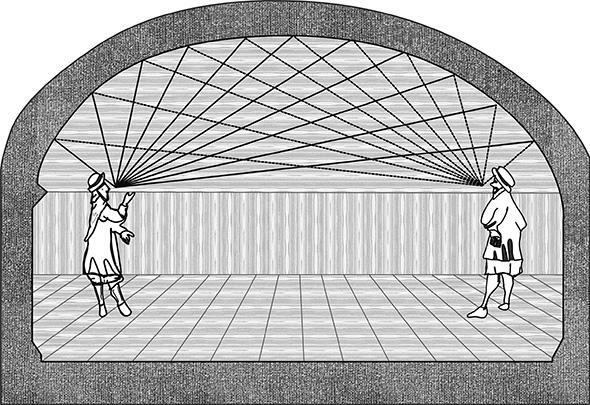 The problem with Kircher’s design is that the listener and speaker have to stand in particular places—the foci of the ceiling ellipse. The design is not very useful if one person wants to talk to an audience of listeners scattered around the room. The address was slowly and distinctly read by his royal Highness, but the reading was somewhat marred by an echo which seemed to be suddenly awoke from the organ or picture gallery, and repeated the words with a mocking emphasis which at another time would have been amusing. The hall’s ubiquitous curved surfaces are probably what caused the mocking echoes. From above, the floor plan appears as an ellipse, and the whole structure is topped with a large dome. The curved surfaces focus sound like Kircher’s elliptical ceiling. But how such reflections are perceived depends on the size of the room. In the vast Royal Albert Hall, the curves cause disastrous echoes. Sound appears to come from several places in the room and not just the stage. In a small room the focused sound arrives quickly; in a larger room the reflections are delayed. The way the brain combines sounds is important, because otherwise we would rapidly become overwhelmed by the vast number of reflections that accompany us. As I type this sentence, the rattle of the keyboard is being reflected off the desk, the computer monitor, my phone, the ceiling, and so on. Yet my hearing is not overwhelmed by all these different reflections; the sound still appears to be coming straight from the keyboard as it should be. The same thing happens in Kircher’s small room. The reflections from the elliptical ceiling arrive quite quickly, and unless the reflections are very loud, the brain does not hear them as separate from sound traveling directly between talker and listener. By contrast, the Royal Albert Hall is so vast that the focused reflections arrive much later, creating “mocking” echoes. The whispering gallery still holds the palm among the show places of the great marble structure. Once in a while an old resident of Washington is initiated into the mysteries of the echoes and other acoustic phenomena which abound in this old-time chamber, and he feels a little ashamed of his tardiness in seeking this remarkable entertainment. The orator who was not cautious enough to remain in one spot during the delivery of his address found the acoustics of the hall taking strange liberties with his elocution, transforming his crescendo sentences into comical squeals, or causing his pianissimo phrases, his stage whispers, to shriek and wail as he moved to and fro from one echo point to another. A gas explosion and fire in 1898 elsewhere in the building led to replacement of the wooden dome by a fireproof construction. Real plaster coffers were installed in place of the trompe l’oeil—changing from a smooth surface to one covered in lumps and bumps—making the effect of the focus weaker and less remarkable. While domes are fun, a completely spherical room is even better because reflections are amplified even more. 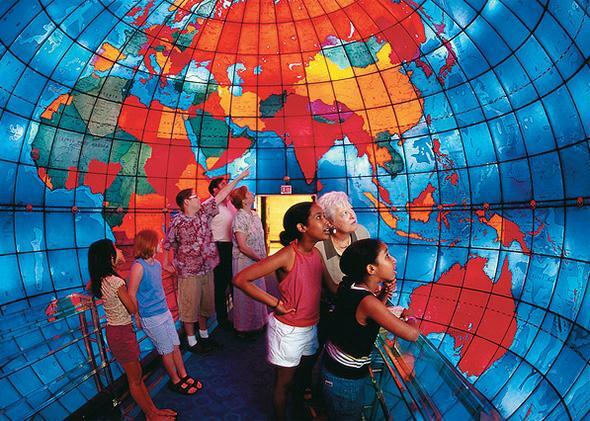 The Mapparium in Boston is a 30-foot sphere and was built in 1935 following a suggestion by architect Chester Lindsay Churchill. It is a giant hollow globe of the world, with the seas and continents vividly drawn on stained glass. Visitors traverse a walkway cutting through the center of the Earth linking up two opposite points on the equator. Three hundred light bulbs illuminate the globe from the outside. Looking at the world from the inside out is an odd experience, but what also strikes visitors are the strange acoustics, which were an accidental byproduct of the geometry. 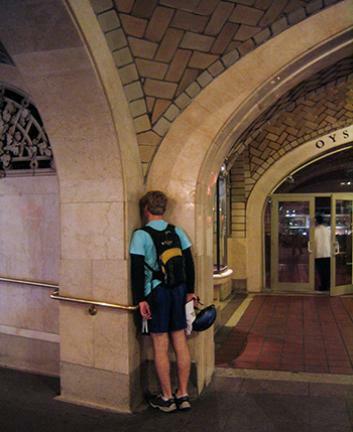 Whispering walls do not focus sound as happens with elliptical ceilings and domes; the listener and speaker are too far from the focal point of the arc. Instead, the sound hugs the inside of the concrete wall and is transported with surprising loudness to the other side. The largest real whispering wall I know of is 460 feet long—it is the concrete dam that withstands the Barossa Reservoir in South Australia. For some reason the dam was built to be a precise arc. This vast, gray slab of concrete has turned into an unlikely tourist attraction, with visitors chatting with each other from opposite ends of the dam. Whispering arches behave in a similar way, and they also show up in the most unlikely of places. On the lower level of Grand Central Terminal in New York City, outside the famous Oyster Bar & Restaurant, sweeping tiled archways, designed by Rafael Guastavino and his son in 1913, support the ceiling. If you whisper into one side of the arch, the sound follows the curve of the tiled ceiling before coming back down the other side. For the best effect, the whisperer and listener need to get close to the stone, like naughty children standing in opposite corners of a classroom. The Grand Terminal Oyster Bar arch in Grand Central Station in New York. The delight in these places comes from hearing a voice carry an unexpected distance, and this effect is more dramatic if the sound is a quiet whisper to begin with. Mathematical analysis by Lord Rayleigh, the Nobel Prize–winning physicist and author of the 19th-century acoustic bible The Theory of Sound, suggests another reason for whispering: High frequencies, like the sibilant tones in whispers, hug the walls closer than the lower-frequency sounds of normal speech. Excerpted from The Sound Book: The Science of the Sonic Wonders of the World by Trevor Cox. Copyright (C) 2014 by Trevor Cox. With permission of the publisher, W. W. Norton & Company, Inc. All rights reserved.